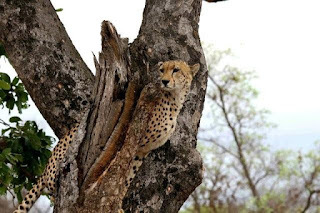 When you come to Africa, to travel on safari with me on one of the lavish safaris I plan on continuing to lead (as long as my good friends at the Africa Safari Co keep paying my airfares), you will learn the hard way that the cheetah is the most difficult of the larger killing animals to spot. 1. There are not many of them. In the Kruger Park, where Mrs Blog and I are currently residing, there are only about 200. 3. I will only ever see something very interesting, such as a cheetah, when I am in a rush to get out of the park, or back to camp before the evening curfew. Mrs B and I have seen this fellow so many times (about four, all up - which is a lot in terms of cheetah spotting) that we have given him a name. Spot. One of the boundaries of Spot's territory is the dirt road that runs between Numbi and Phabeni gates in the south east of Kruger. When we've seen spot he's bee scent marking (poohing and weeing, to you and me) on prominent bits of high ground along the road, such as this tree. 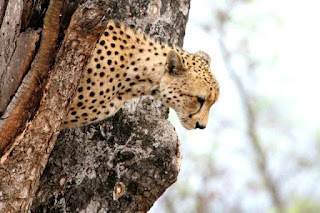 Cheetah don't lounge around in trees (like leopard), but they do like getting up on things to mark their turf, and to scan the surrounding country for meals. In contravention of rule 2 (see above), Spot is not nervy, flighty or highly strung. He's a big male who is very sure of himself and very unafraid of people in cars. In this respect he's like a lion. He couldn't give a Cheetah's squeak (they do squeak, rather than growl or roar) about tourists. Spot strides down the road like the Leonardo di Caprio of the veldt - king of the world, if you will. He also does OK with the ladies and we have seen him in the company of female, who we christened Dorothy (Dot... get it?). As to rule 3 (above) Mrs B and I invariably see cool things on the odd occasion that we are in a rush, and that doesn't happen very often. On the day we last saw spot we were hurrying to Hazyview to pick up Miss T, a former work colleague of Mrs Blog's, who spent a week with us (I must add, here, for the record that Miss T was very low maintenance, and well up for a bit of the old animal spotting, which makes her our ideal type of guest. Plus, she left behind a cool cowgirl hat that Mrs Blog has taken to wearing, so all in all, a good visit). Yesterday, we were rushing to get out of the park to the nearby town of Nelspruit so I could get an anti-hijack immobiliser thingamebob fitted to our new(ish) Land Rover, Broomas. Broomas already had an alarm and an immobiliser, but that wasn't enough to satisfy the insurance company in the land of the car-jacking. Of course, we saw a leopard, didn't we... stalking impala just near Malelane Gate, and didn't even have time to get a decent picture. seeing as you're almost on speaking terms with Mr Spot .. would you ask him if he could possibly hang about in spottable spots during December? He was hard to see, what with all that camoflage, but well worth the effort! Beautiful, extraordinary photo! And the narrative had me in stitches! Hehe. Still grinning. Thanks for that. Oh My - What a beautiful big boy Spot is!!! They are stunning photos - thank you. Im just stopping by to say "Hi" and giving you a big "THANK YOU" for visiting me at my blog. It was a real thrill to see your comment. I am always in awe of people like you and Kevin who fly South Africa's flag in the work that you guys do. We try and do our little bit too, in turn, by highlighting such things to our many overseas readers. BUT, Bottom line - Thank you for doing that and we are delighted to have found your blog! We'll be followers from now on. Take care and wave 'happy waves', to the animals, birds and little creatures, for us in the Kruger. Attention, the rest of you animal lovers, Maxdog is a very talented South African dog who has his own blog. Click on his profile above and follow the link to him. He has a true legion of fans around the world and has lots of nice things to say about South Africa (very refreshing, in fact). you have a new Landy? When are yu going to the Bushveld, go see the white lions at Mamatau and visit Molalatau for a picnic and braai. And off course sms me so dad can come say hello too. He enjoyed your book by the way. Each time he went to the loo he said he's just going to park himself with Mr Park. Sorry but it was funny. Thanks for the cheetah pics. Woop de doo .. 28 sleeps to go.. been sorting the Cecile de Mille camera gear out ready for the sojourn to the dark continent again. Ali G get her ladyship to check out fellow follower Alison Nicholls' blog. She's a wildlife artist who visits africa and in a recent post she shows off her bush skething/painting kit. Also, I'm not sure whether Maxdog is a Maxwell or a Maxine, but his owner is a her, not a him, so sorry for any confusion. I'm still confused, though. Twas after checking out Alison's blog that her ladyship raced off to town to the art shop to get just that ...a bush sketching/ painting kit ...has been practising with the cats at home getting ready for the big guys in Kruger. Nelspruit, Mpumalanga one of my favourite parts of Africa.